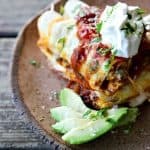 Overnight Taco Breakfast Enchiladas are the happy marriage of breakfast egg bakes, taco flavours, and enchiladas all together in one convenient, delicious package that is assembled the night before it bakes, leaving you to dream of satisfying, hearty breakfasts with no more work than sliding a pan in the oven! I’m not a breakfast person… I could happily live on tea until about noon or so and then eat all the things. My kids and husband, however, NEED BREAKFAST desperately and preferably soon after they wake. Couple that with the fact that I’m incapable of intelligent conversation or action before 11 am and you have a recipe for unrest. Due to self-preservation, I’ve amassed quite a few excellent make-ahead breakfast options to share with my ravenous menfolk. Today’s Overnight Taco Breakfast Enchiladas recipe is near the top of that particular list for a multitude of reasons. 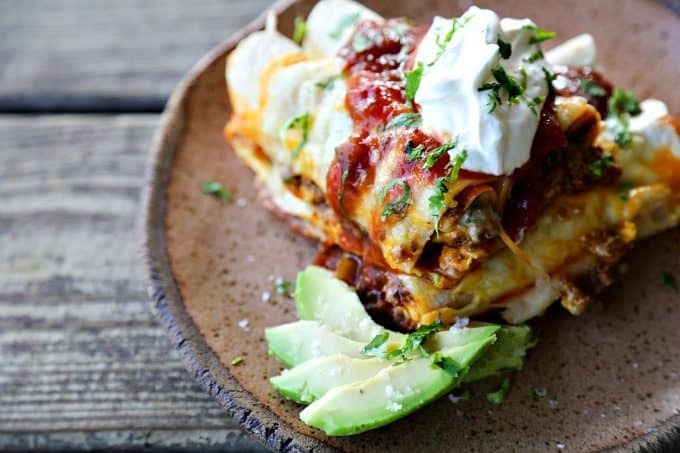 Overnight Taco Breakfast Enchiladas are an excellent combination of many of the things my family likes best; tacos, enchiladas, and breakfast egg bakes all in one super convenient pan. Added to the deliciousness of all of those things combined is the tremendously helpful make-ahead aspect of the dish; everything is assembled before I go to bed. You know, when I’m still coherent. In the morning, when I roll out of bed and stumble down the stairs to get my tea kettle going, all I have to do is take the pan from the refrigerator and slide it into the oven and turn that oven on. I don’t even have to remember to preheat it or cover it with foil, because I covered it with foil the night before. WHEN I COULD ACTUALLY THINK. When the oven beeps, I set the timer and grate some cheese or rustle up some already grated cheese and then wait and sip my tea. And as good as this smells when it comes out of the oven, even this affirmed non-breakfast person wants to grab a bite or two. 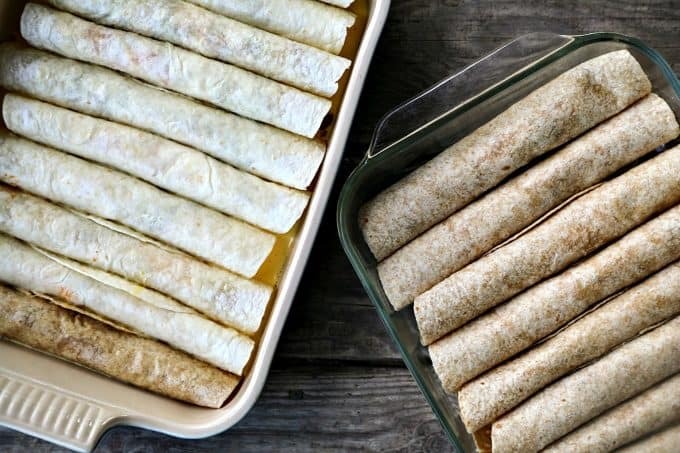 You can opt for white flour, wheat flour, or corn tortillas in your Overnight Taco Breakfast Enchiladas. Some things to keep in mind: white flour tortillas absorb the egg mixture the best and puffs up nicely. Wheat flour tortillas puff up the highest, but then fall back as they cool. Corn tortillas have the lowest absorbency/puff rate of all, but they’re the most traditional. Our family prefers white or wheat flour tortillas in this dish. If you choose corn tortillas, remember that most of them are smaller than flour tortillas, so you may need twice as many to fill your pan. That’s not a problem, it’s just the way it is. If using white or wheat flour tortillas, the 8 inch size fits best in the 9-inch x 13-inch baking dish. I love to use leftover taco meat made with this homemade spicy taco seasoning, but you can use whatever leftover taco meat you have on hand! Feel free to double this recipe! Leftovers hold and reheat beautifully for about 4 days or freeze well for longer storage. For optimal convenience, use leftover taco toppings on your overnight taco breakfast enchiladas. If you don’t have leftover taco stuff on hand, shred some lettuce, cheese, chop some green onions, and have some salsa and sour cream on hand in the refrigerator. That will make your breakfast that much more simple to lay out in the morning. Use non-stick cooking spray or brush olive oil to generously coat the bottom and sides of a 9-inch by 13-inch baking dish. Toss together the shredded cheese in a mixing bowl and then set 1 cup aside in a container or bag in the refrigerator for the next morning. Mix the taco meat into the remaining 2 cups of grated cheese. Scoop a generous 1/3 cup of the taco meat mixture in a mound down the center of each tortilla. Roll the tortillas up and arrange seam-side down in the prepared pan. In another mixing bowl, whisk together the half and half, eggs, flour, chili powder, salt, and black pepper until smooth. Pour this over the rolled enchiladas, cover the pan with foil, and place in the refrigerator overnight or for at least 8 hours. In the morning, slide the foil covered pan into the oven and set the temperature to 350°F. When the oven indicates that it has reached the correct temperature, set your timer for 30 minutes. 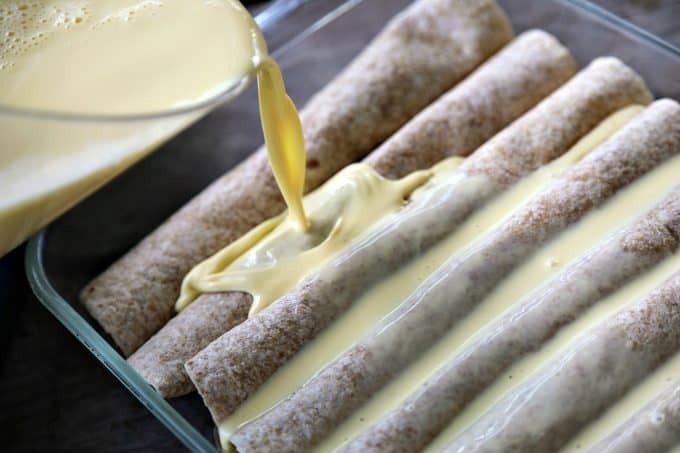 After 30 minutes, remove the foil, sprinkle with the remaining cheese, and bake for 10 more minutes or until the eggs are fully set, the tortillas are golden brown, and the cheese is fully melted. For most convenient servings, cut through the enchiladas at the center, yielding 20 smaller breakfast enchiladas. Serve with any or all of the following: sour cream, lettuce, salsa, avocados, hot sauce, cilantro, black olives, or green onions. 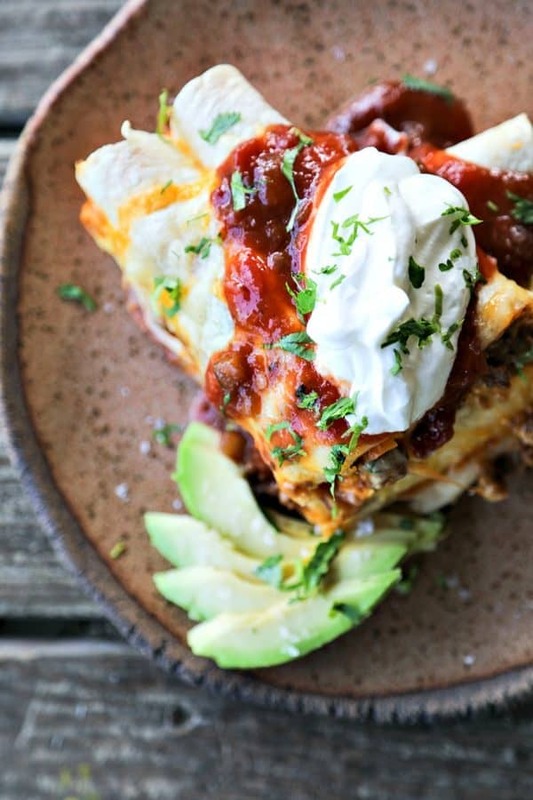 Love these Overnight Taco Breakfast Enchiladas? Try these other Make Ahead Breakfasts! Since enchiladas are not made with flour tortillas I’m curious about how this wouldn’t turn into a mushy, gloppy, goo. Even after being baked it will still be like paste. Hi Scotia- It doesn’t turn to paste or fall apart, the egg absorbs into it somewhat but it holds its integrity and puffs up. That said, the recipe DID suggest subbing in corn tortillas if you prefer them. I have tried it and thought the corn tortillas fell apart more than the flour, though. That said, enchiladas are traditionally but not exclusively made with corn tortillas so you do you.